Park Ridge East, located on the east side of Smith Road between 3rd and 10th, is a popular neighborhood for anyone looking for mid-priced homes in a quiet setting that is not too far from Indiana University. Currently there are seven homes available in Park Ridge East and they are priced from $179,000 to $285,000. This neighborhood is made up of ranches, bi-levels and colonials and each style is represented in the current available inventory. 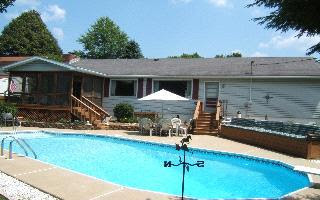 The house in the photo above is currently on the market and priced at $197,700 and offers 4 bedrooms (one bedroom is located in the basement), two full baths and has a great pool in the back yard. With over 2600 finished square feet, this house has a lot to offer. The only negative is the train track behind the house...the listing agent stated that only two trains travel the track each day. Awesome pool!